You can see the point where the Imp trail reaches Cowboy Brook, where the bushwhack begins. Ha! George Washington gets one mountain in the Whites, while Jimmy Carter gets four! Okay, maybe Carter Dome, South, Middle and North Carter are named for someone else, but from their summits one can sure look up to Washington like Carter likely did (or, actually, from viewpoints near these partially-wooded peaks). 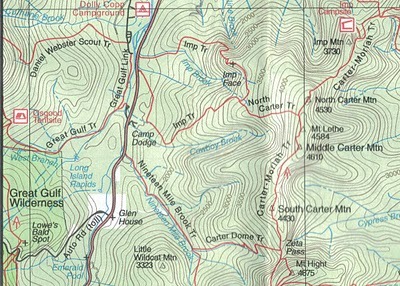 So the plan this Sunday (Sep 18, 2011) is to reach South Carter with Riley via the 19 Mile Brook Trail, Carter Dome Trail, and the Carter-Moriah Trail, then cross to Middle Carter, and take the North Carter Trail to the Imp Trail back to the car. SCREEEEEECH! Wait, what? Someone put the needle on the record… Can’t you see on the map that loop don’t close? Yeah, it annoys a lot of hikers who want to reach these two peaks. The Imp trail veers north at a point where Cowboy Brook drops to Route 16. To stay on the trail means putting an extra mile or two between you and your car at 19 Mile. A lot of people bushwhack down the brook from here, or follow the Imp Trail to a point where a logging road leads to Camp Dodge. I’ve decided to try to bushwhack right over the hump between the trails directly to the 19 Mile parking lot. The bearing is 290 magnetic from where you have to cross Cowboy Brook. a bearing of 235 brings you over the ridge to the next drainage, a small tributary of 19 Mile Brook a little further from the lot. The forest is supposed to be open hardwoods, so we’ll see. This entry was posted in Childs' Play, Family Posts, Hiking and tagged 19 mile bushwhack, carter bushwhack, carter dome, carter dome hike, carter hike, carter mountain, carter nh, carter whites, imp bushwhack, middle carter hike, north carter bushwhack by Tom Bishop. Bookmark the permalink.